I have gotten some questions regarding the Power BI Sites and usage of them. There are two different aspects to Power BI, and I wanted to go through them to help folks understand their usage. 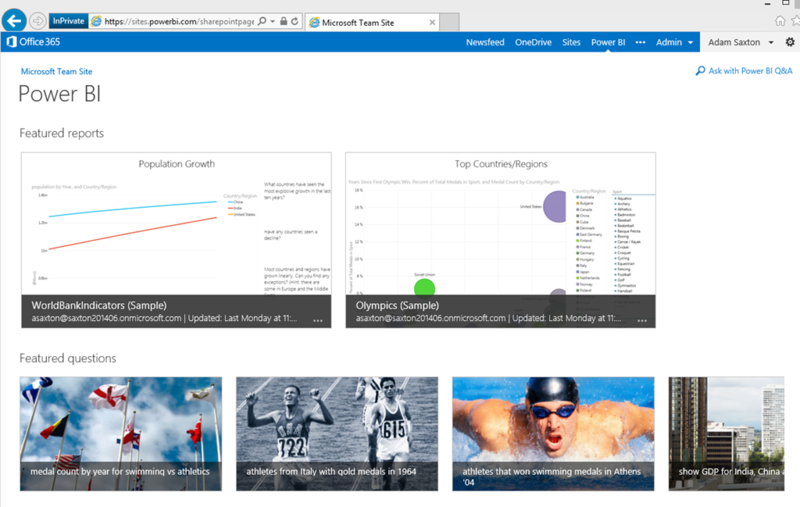 The Power BI Site is attached to a given SharePoint site. It provides a different view into your site and document libraries. Think of this as a visual shell around your site that lets you use the features of Power BI in a way that is easier to discover and use. This is where you can add documents, or enable workbooks. You can schedule a data refresh, add a document to Q&A or mark a workbook as a Favorite. This is all in the context of a single SharePoint Site. Within a given tenant/subscription, you may have multiple SharePoint sites that are available. 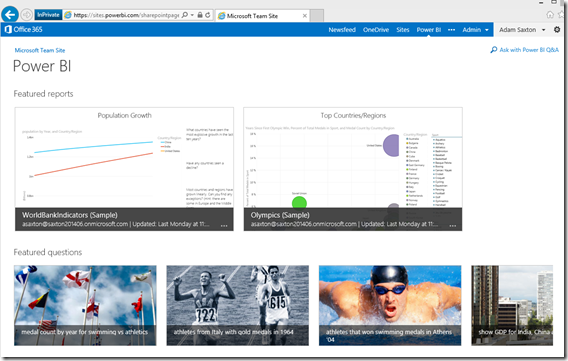 Within these SharePoint Sites, you may use Power BI and work with different documents in different locations. It may become a pain to go to each individual site to get to the documents that you work with. This is where the “My Power BI” site comes into play. This is all about your view as a user, to the documents you have marked as favorite from the main SharePoint site (see above). 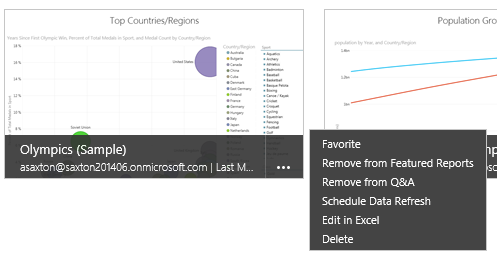 In the top bar of O365, you will see Power BI listed there. 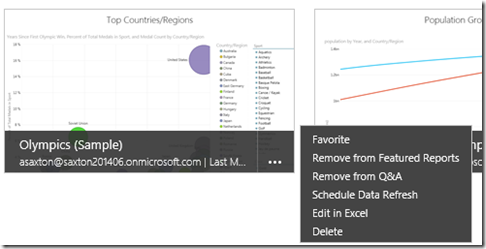 This is to make it more discoverable for users to get to Power BI. Clicking on “Power BI” in the top bar will take you to the “My Power BI” site though. Not an individual SharePoint site. This will show the workbooks you have marked as favorite from across all of the different SharePoint sites within that tenant. Also, for some navigation, off to the right side, it will show favorite sites, and other sites within that tenant as a means to navigate. From a workbook perspective, you can go in and use the workbook, but if you click on the ellipsis (…) you will only have the option to unfavorite the document. You will also not have an option to add a document from this perspective, as it doesn’t have context as to which SharePoint site that would be applied to, or even which Document Library. To add a document, you would need to go to that SharePoint site and add it there. Hopefully this helps to explain the two different perspectives.